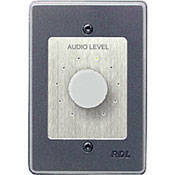 The RCX-10R is a wall-mount volume control for use with an RCX system. It is ideal for those who prefer a rotary control and do not use the music source of their RCX system. It can also be used as a volume-only control in a room that does use the music source. The RCX-10R has LED indicators to show the volume level. Up to two units may be installed per room. The RCX-10R should be installed using an RDL WB-1U box. UltrastyleTM design features an all-steel panel and rear enclosure. Box Dimensions (LxWxH) 7.0 x 4.375 x 2.25"